Good news, my friends. Today I’m talking about A New Quilt or more specifically A New Modern Jelly Roll Quilt. This quilt started with a Jelly Roll I picked up at QuiltCon. I knew I wanted to try Kimberly’s Jelly Roll Jam Quilt because I had been invited to watch the filming of Jelly Roll Jam II which is a speeded-up version of the first video. The video below is the original full-length Jelly Roll Jam Quilt video, and it goes into detail about how to make a simple quilt from a jelly roll of fabric. I used the full video while working on this quilt, but now that I’ve made one I will use Jelly Roll Jam II for any other quilts I make using this method. Like I said, I started with this jelly roll from Cotton + Steel. One of the cool things about this quilt is the jelly roll has enough strips to make two quilts. I separated out all of the colors I wanted to use and saved the rest. For my quilt I chose the blue/turquoise/pink/gray strips. I left out the low value colors and the greens and golds which I will probably use in another quilt. From there I followed the video instructions for piecing my quilt top. Once pieced I found some fabrics in my stash for the quilt back and binding. This is a really fast quilt to put together. I was amazed at how good it looks because the amount of effort is not equal to the outcome. I probably could’ve obsessed about where each individual strip would end up, but being clueless has some advantages. If you look from a distance you can see how my random placement still creates a measure of design. Here are pictures of the front and the back. Below, I will discuss my rookie mistakes below. I used a fairly large scale stipple so my quilt wouldn’t be too stiff. Best of all, I only got ‘lost’ a couple of times and had two small ‘cross-overs.’ Before I snapped this photo I looked for my little mistakes. Apparently, they are so insignificant I couldn’t find them. We’ll call this a hidden rookie mistake. I had the binding fabric in my stash and it was a perfect complement to the quilt’s fabrics. It’s hard to see, but the small dots are white and a very light shade of pink. When you see it up close, it’s more noticeable. As for stitching down the binding ~ well I could stand to get better at this. I thought about hand stitching down the binding, but it would still be ‘unfinished’ if I had chose that direction. With binding, I really need to get better at the corners, but otherwise, it’s fine as long as I don’t expect to enter it into a quilt show. We’ll call this a forgivable rookie mistake. All-in-all, I am really happy with the outcome of this quilt and have racked up fewer rookie mistakes. My main one being some matching corner issues. They’re only visible up close and I don’t feel like they are a big deal. I probably could’ve avoided this mistake if I had used a walking foot when putting the larger blocks together. 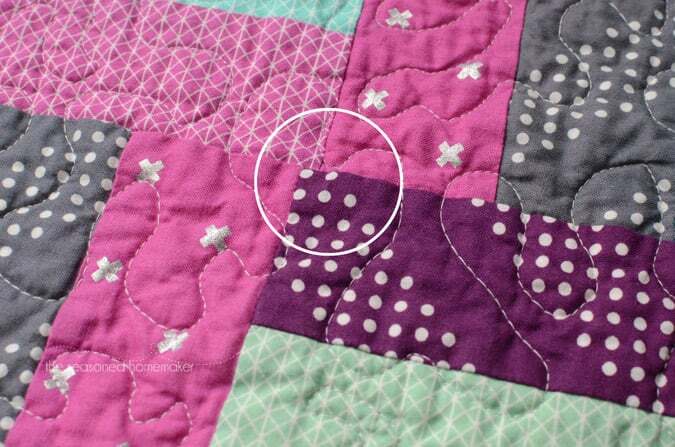 Fortunately, the Quilt Police usually forgive these mistakes from novice quilters. I won’t call this a rookie mistake, just plain ol’ bad piecing. If you are new to quilting and want to try a simple project then I highly recommend this one. The quilt goes together quickly, and you get to work on techniques like piecing. The finished quilt is the perfect size for a baby gift or a nice lap throw. For me, I will remake this quilt in different fabrics and continue to work on my free motion quilting. Isn’t it wonderful how quilting has so many benefits. The quilter gets to spend time doing something she loves and the quilt recipient gets a lovely gift. An all-around win in my book. I have a new grandson that I would make a nice warm quilt, then maybe some other baby accessories. I have been wanting to make a jelly roll jam quilt. I like the quilt you made, so I would make a similar one. Your rookie mistakes are very forgivable. Why do we search for them in the first place? I will make the same pattern as above. I will make it for “me.” 2014 was a lost year having neck issues and 2 surgeries. I am getting back to me! Dusted off my machine this month and made a few projects, I feel like I have been given a fresh start. I would make a mini quilt and matching mug rug for my sewing room. I’d make a beginner quilt. I’ve thought about making one for a long time and this fabric would give me a chance to give it a try. Your quilt is gorgeous! I would make a variation of it! Thank you and FQS for the chance to try some Cotton + Steel! I am teaching myself how to sew AND making a quilt for our bed is high on my list. I’d love to make a quilt for our bedroom. The colors would be perfect! I would make my sister a quilt for her wheel chair. She has MS and gets chilled easily. I’d love to make my very first jelly roll quilt. Quilt making is an art we need to preserve and share. I would give it to my Mom, who has a made a beautiful, hand-quilted quilt for each of her 8 grandchildren as a high school graduation gift and is now working on a stash for her great-grandchildren (3 given away already, 2 more to be given soon and ? to be used for future babies!). I will either make a cover for my machine or a quilt for my dear granddaughter who loves to snuggle under a quilt my grandmother made! I would make a quilt for my daughters room. I make a quilt for my nieces and nephews when they graduate from high school. Last year there were five! So I am a few behind. The fabric would help me catch up. I would love to make a lovely zigzag quilt! Ive seen patterns for chevron designs using jelly rolls. My 18 year old daughter just said that she would love to try to make a quilt so this would be used for a wonderful first project for her! Beautiful colors in that quilt! 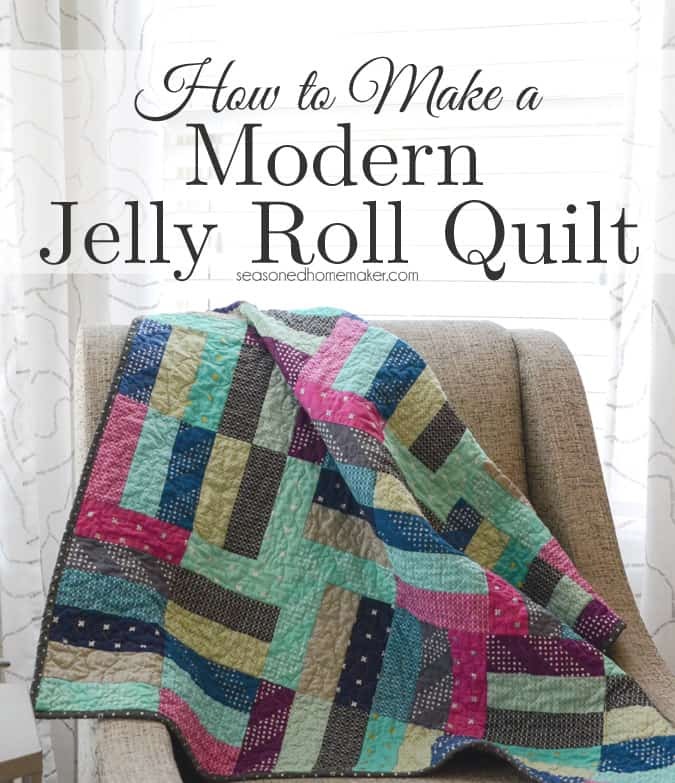 I’d love to try a jelly roll jam quilt, looks like fun! Your quilt looks awesome! I would try the pattern you used and donate it to the Linus Project. I am anxious to get back into quilting….it’s been years since I tried. This just might give me that extra push! What a pretty quilt! Good job! I think that my piecing gets better with each project I make too. I have not been brave enough to try free motion quiltng yet – perhaps a class at my local store is what I need to make the leap. If I won the jelly roll, I would use it to help my daughter make a version of the jelly roll race quilt. She is just learning to sew this summer, so in order to limit the frustration level, I want to choose something that does not have points to match for her first projects. Thank you for the chance to win! Your quilt is beautiful. The ‘mistakes’ you pointed out made me feel so much better about my quilting. So many quilts seen on line are beyond my expertise, your looks doable. Thanks for sharing. Love the colors. I would make this quilt for my daughter who recently enlisted in the Air Force. Beautiful job on the quilt, Chris. I would love to make a quilt for family room. I Want To Learn To Sew And I Think I Could Make A Quilt For My Grandaughter Jaydelyn. I’m afraid I’d have to copy yours!! I love it, and I love the fabric. This is so me, I’m going to have to make this!! I have never made a jelly roll quilt and it looks like fun so I think I’ll give it a try. The Cotton and Steel fabrics are gorgeous! I would love to make a jelly roll jam quilt! The perfect quilt to curl up with my morning coffee and read your blog. Thank you! I’m afraid I’d have to copy yours! I love the fabric and pattern, and will have to make this!! Hah! I just watched the original Jelly Roll Jam video. I’d make that quilt! I don’t quilt but would love to win this to give to a very generous sister in law. She makes beautiful quilts. I’d make a quilt as well. I have a few in mind that are jelly roll friendly. Thanks for the chance. I love this colors. I would make a simple quilt like the log cabin to showcase the beautiful fabric! I would love to make a quilt with these pretty Cotton & Steel fabrics. Just finished my first quilt ever for our oldest grandson’s graduation, a queen size! Anxious to start the next one. I’ve quilted for more than 15 years and have never made a jelly roll quilt. Would be excited to try one. I love using the MODA Bake Shop for patterns and ideas for using pre-cuts. I have not made the Jelly Roll Jam so that would be something to look at. I also love making totes..so many options. I would like to try Fat Quarter’s Jelly Roll Jam, also! Kimberly’s videos are friendly and easy to understand and follow! Thank you so much for the opportunity to win such lovely fabric! I would make a comforter/quilt for a cousin of mine who is graduating from college this year! I would make a jelly roll quilt of some type. I have a few patterns for them. And your quilt is lovely. I think I would do a strip quilt…those are my favorite. I have some books with different patterns and techniques I’d like to try. 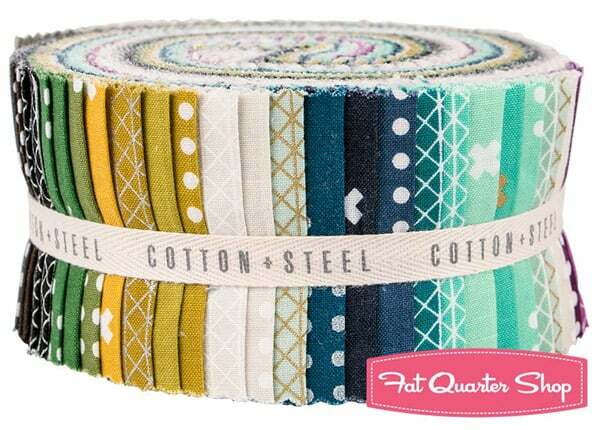 The Cotton + Steel jelly roll would be a perfect start to a color wheel type quilt! I have made one quilt…with Lots of mistakes…so I would love to give it another go with this beautiful fabric! I would love to try to make a quilt especially after seeing your beautiful creations. I can’t find your hidden rookie mistake, so your secret is safe with me! Can’t edit – if I won the jelly roll I would make it for our new friend with cancer. She’s just started her treatment, second time in 10 years. Thank you! I LOVE the way your quilt turned out! I think I would make a variation of rail fence (or maybe a log cabin?) quilt. 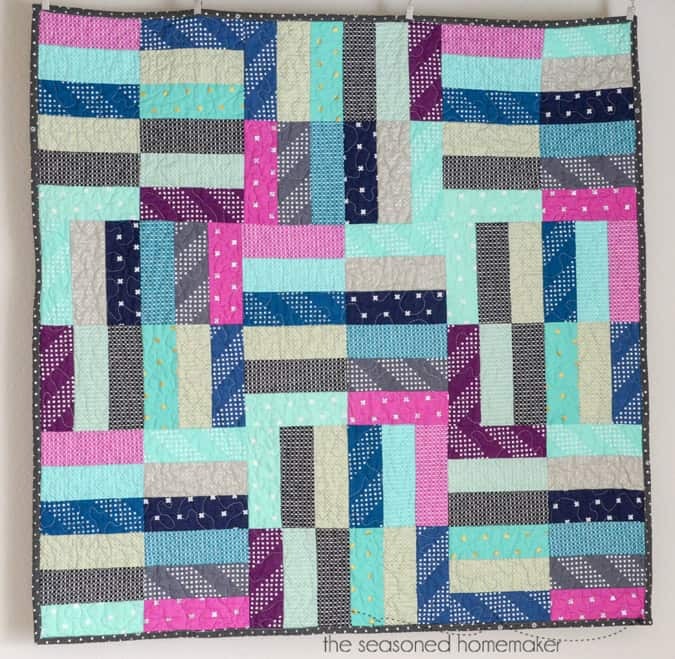 Ooh, I’ve been wanting to make a Jelly Roll quilt, similar to the one you made, but where the sets of 3 strips alternate, making a basketweave look. I’d like to try that with this Jelly Roll…love the colots! I’d make a quilt. I’ve helped (okay, maybe more like watched) my teenage daughter make a few beginner quilts. Her first one in the same pattern as yours. I love that pattern and would love to try quilt making. I would make the jelly roll jam am new quilter thank you for the chance…..
I’d love to make baby quilts!! I haven’t made a quilt since my oldest grandson was a baby and he just graduated from high school last week. A perfect time to start quilting again and make one for him to take to college this fall. I would make a un perfectly beautiful quilts. I would enjoy the satisfaction and adventure in making it. My best is good enough. I have always wanted to try a jelly roll. Your finished quilt is just perfect enough for me to attempt it, too. I would use the colors that you didn’t! I got new curtains for my guestroom-natural linen with natural vine embroidery. Those colors are unlike me and would be a refreshing change! I’d love to make a quilt with this fabric! This is a wonderful line! I would make my very first quilt. I’d love to make some quilted baby bibs! I would use the colors that you didn’t! That would be unlike me and refreshing! i would make the quilt summer in the park. I would make a quilt for my grandson’s 4th birthday. I would love to use this beautiful Cotton & Steel jelly roll to make an amazing quilt! I love your quilt. I never worry about crossing my stippling (not that I want to) because I usually make my quilts for my family and they never notice. I would love to try making this quilt if I won the jelly roll. I just found a pattern from Bonnie Hunter using the 2 1/2 strips called Texas Two Step from the More Adventures with Leaders and Enders book. I would love to use a Cotton + Steel collection for this great looking quilt. I would probably use the entire jelly roll without pulling out any color family from the rest. Thanks for the offer and giveaway! I love your quilt and don’t be so hard on yourself – remember it is hand made and that’s what makes it special!!!!! Oppps – I would make a quilt for my 83 year old Mom! I am very, very, VERY new to quilting but I want to make two quilts by Christmas. One will be for my daughter-in-law and one will be for who I hope will be my new daughter-in-law. This and the video will help me a great deal. I really want to learn how to quilt. I do sew, and my mother-in-law is an expert quilter. I think that it would be something nice that we could do together. What a fun and easy quilt! I’d love to try it! I’d let my daughter have it, because she is quilting now. I was thinking of making a tote bag with the jelly roll. I would make a baby quilt for my new granddaughter due in August! Love the quilt! I’d love to make this quilt! I’ve heard much good stuff about the cotton and steel fabric, and have been itching to try it! Our son and daughter – in law are expecting a son in September and would love to be able to make him his first quilt! A bed cover for my newly graduating niece – it would be a great addition to her new dorm room! Thank you. Love your quilt. I would use the jeiiy roll to make quilted designer bags and perhaps a couple of table runners or a small qiult. Thanks for the chance to win the jelly roll. I love your quilt! The colors are beautiful. I would love for you to link up your sewing project at the Stitch It, Blog It, Share It Link Party going on now at BehindtheSeamsSewing.com. I would love to make a quilt for our daughter! 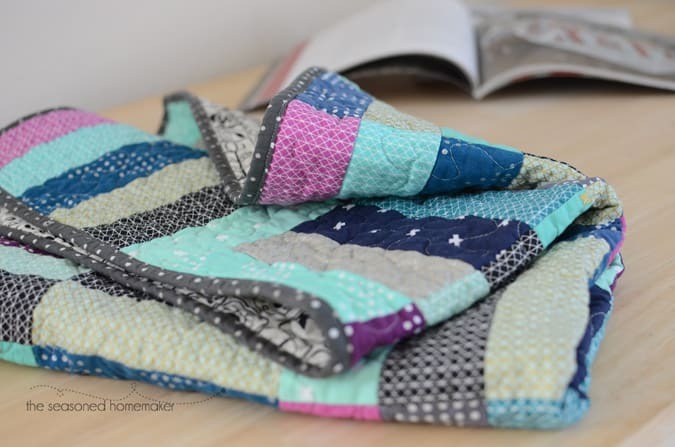 I’m a fan of the strip+flip method for quick jellyroll=>baby quilts asap. But the jelly roll jam looks like so much fun… I’d have to unroll the whole thing and lay the strips out on the big table and play with the gradient potential a bit to know for sure. I love your quilt and would like to make the same pattern. Wow, such a cute quit! I would love to win, I have never bought a fat quarter and have been wanting to try making a quilt, And the video makes it look so easy. I would make a small quilt for my my mini dachshund to lay on the couch with. I think I would like to make the Sunday Morning Quilt. I love the modern but scrappy look to the design. Thanks for a chance to get more fabric. I haven’t purchased any Cotton and Steel yet. I would love to make a quilt like that for my sons new apartment. I would use it in a twin sized log cabin quilt. I really like the quilt you made, and would like to try one also. So simple, yet so cute. Definitely a quilt to snuggle under for our new home. I think a quilt for a good friends son to take to college would be in order. It would be a first for me, however! I’d love to try it. This beautiful fabric will be a wonderful contribution to the Prayer Quilt ministry at our church! I would make a quilt! Not sure exactly what pattern I would make, but the one you made is awesome. I might just have to make! The last quilt I worked on was a hand quilted wedding ring design with my grandmother. It brings precious memories of time spent with her. I’d love to actually piece my own jelly roll quilt with my granddaughters so they will have the same special memories of time spent together. Thank you for sharing the jelly roll video. I’ve always been daunted by the piecing of a quilt but after watching this video I KNOW I can piece this one. I might give the quilt to my childhood friend who is battling cancer. I love, love, love your quilt back. I’d have a hard time deciding which side to display if this was my quilt. 🙂 Both sides are beautiful. I love your jelly roll jam, or I might make a herringbone-type quilt. These fabrics are beautiful! I think I would try the jelly roll jam. I have never used a jelly roll but it has been on my bucket list. I want to make a throw for my guest room. I’m decorating it with a very cottage garden feel because it overlooks my butterfly garden and peach tree. 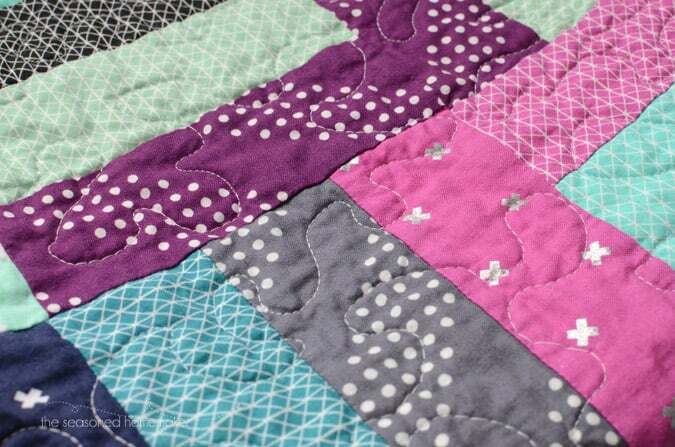 A beautiful jelly roll jam quilt will be the perfect cozy touch! I’d like to make something to hang in my office at work. Thanks for the great giveaway! I have never quilted but I think this looks simple enough I could do a quilt for each of my children and my new grandson. Now that would be something! I love that you used a black and white print as your backing. How striking! I have material from my mom-in-loves stash that will make these quilts special. I would like to make a simple random stripe happy quilt. I really like quilts and would enjoy another one. If i won the give away i would make a quilt for my wonderful son whom unfortunately. Resides w his father, my ex, in Missoula, Montana. I try to make & send him as many gifts & things as i can so its like im always there with him even though im in Texas & he is half way across the country. He loves receiving packages from me & i love sending him stuff! & im extremely excited because even though i sew all the time this would be my first quilt making experience& i cant wait to make many many more from here. Tgis is also the way im going to be able to start my own online business & pay my way thru cosmetology school. Thanks for the amazing how to! & giveaway! I cant wait to find out who the lucky winner will be!! I would like to make a lap quilt for our RV. My hubby keeps it to cold in there. Thanks for sharing. I’d definitely make one of the quilts from Sunday Morning Quilts. I love Cotton and Steel! I would use this to make 2 smaller blankets- one for my son and one for my daughter. They would be perfect for on the couch since they would coordinate but they could each still tell which one was theirs. If I had this jelly roll, I would try the same pattern you quilted because it seems to allow for rookie mistakes. I probably would have many. Cotton + Steel has such lovely designs and colors. I am inspired by the patterns and colours in this Cotton and Steele Jellyroll. I would enjoy making a reading quilt using the pattern you demonstrated or maybe this one where the strips run side by side and then at 90 degrees. I love your quilt mistakes and all and I’m sure that they aren’t even noticeable in person. I’d love it if you shared this at Worthwhile Wednesdays. I love the colors you choosed. A good friend of mine is getting a baby soon. I would make her a sweet baby quilt. Thank you for this Giveaway. I would make my first quilt ! I have wanted to quilt for a couple years now but was too afraid I’d mess up. However, your rookie mistakes and the awesome final result of a darn nice looking quilt have given me encouragement and motivation ! Thanks for this post, Leslie !,. I am hoping to make my first quilt this summer. Pretty excited…and a little intimidated! I would make a quilt for one of the residents at the group home I work for. She loves quilts and loves to helps with them as much as she can. This would be an awesome project for her. I wou make a few things! A one hour basket a dumpling pouch!! Thanks for a chance!!! I just found your page!!! Alogator pulled me in!! Man, I’d have to look thru my long, long list of to do one day quilts to decide on the perfect pattern for these beautiful fabrics! I would make a quilt for one of the new babies in the family! Your quilt is beautiful!! If I won, I would make a quilt and donate it to my local Pregnancy Resource Center. Thanks for the chance to win!! My mom watched a video on how to make a similarly quick jelly roll quilt, and was enamored. I would enjoy working together with her as she relearns sewing after too many seizures. Thank you for the design options! I love your quilt! My question is where do I find the big jelly roll of fabric? I’ve not seen anything like that at my local fabric stores. I’ve not made a quilt before but have been researching and reading up on making one for a while. In doing this I’ve been looking for supplies. Any advice is appreciated. I recommend looking first for a local quilt shop. They should have a selection of jelly rolls. 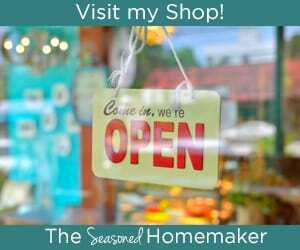 If there isn’t one close by, visit FatQuarterShop(dot)com. They usually ship the same day! Your quilt looks amazing! I would love to make a similar one for a close friend. Thanks for your great tutorial! 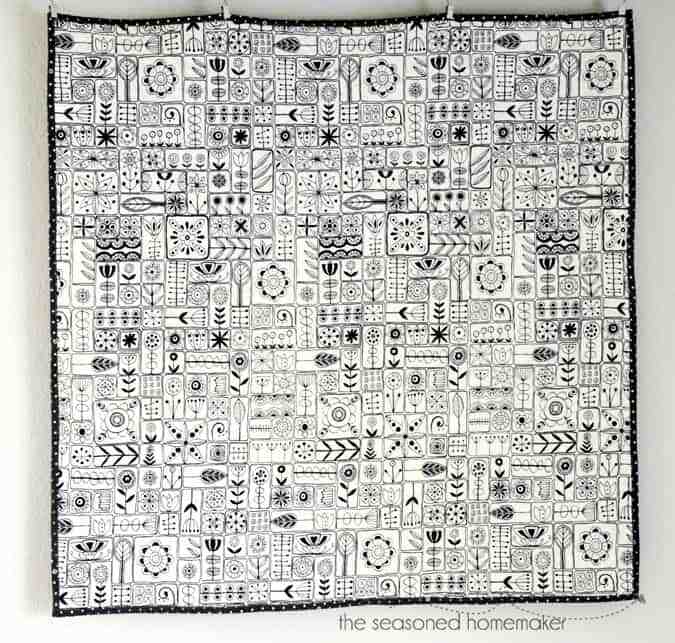 I would love to make a lap quilt for the cold weather that is now upon us. I just started free motion quilting a few weeks ago and found that pillow shams are a good way to learn as well as they are smaller to work with. I also loved learning about Machinget gloves that help me keep a grip on my fabric! Our church makes quilts for area charities, we would put this beautiful fabric to good use. You might have me quilting yet. I too have made those rookie mistakes and have ended up covering them up with appliques. I have done binding by machine but have gravitated toward the look of french binding by hand – I can finish a quilt in one day, it really does go fast. Great job on your quilt! I’d make two quilts to have on hand for baby gifts!